Here is the core of the magic system. Spell crystals alone function sort of like scrolls (consumed when used, no mana cost), or they can be inserted into foci for repeated use (such use requires mana). I think this creates an interesting and diegetic magic economy while not compromising either simplicity or flexibility. They system for sustaining spells also reigns in the complexity of stacked effects without artificially limiting the power of spells. Right now, I see black and white mages starting with a wand (focus) and 3 crystals of 1 mana spells and red mages starting with a wand and 2 crystals of 1 mana spells. Magic is the ability to use the power of mana to reshape reality. On its own, however, mana is raw potentiality. It is dangerous and overwhelming. Only some character classes, notably mages, have the ability to use magic. Magic comes in two varieties, black and white. Black magic is mostly destructive and offensive, while white magic is mostly supportive and defensive. The two types of magic are different enough that they require different skills to master. Black mages can only cast black magic and white mages can only cast white magic. Red mages learn how to manipulate both kinds of magic, but this generality comes at the cost of specialization. In order to focus and tame the dangerous power of magic, mages have learned how to encode spells in special, alchemically prepared crystals. Spell crystals may be used directly to cast the spell contained. No external mana is required, as the spell draws upon the mana originally used to encode the spell, but using a spell crystal in this way consumes it. In other words, when using spell crystals directly, spells may be cast “for free,” but this uses up the crystal, leaving only a worthless, burned out husk. Spell crystals are considered insignificant items for purposes of encumbrance. Mages can manufacture copies of any spell crystal they have access to, though the process requires expensive material components (50 GP per point of mana spell cost) and takes a full town turn. Sometimes special components, such as unrefined meteor crystals, may be used in place of purchased alchemical reagents for spell crystal creation. Spell crystals, on their own, are consumed when used. However, with the help of a focus, mages can use spell crystals multiple times. Foci allow a mage to supply the mana required for spell casting themselves rather than drawing on the inherent mana infused in the spell pattern. Most foci are wands or staves, as something about that shape helps facilitate the channeling of mana. Each focus may hold one spell crystal. Traditionally, all apprentices of the three primary mage orders are given a wand (that is, first level mages begin with one wand focus). Each focus carried is encumbering. Special foci exist that can add benefits to the casting of certain spells. For example, a particular magical staff might add extra damage to fire spells that are cast using it as a focus. Attaching a spell crystal to or removing a spell crystal from a focus is a complicated and delicate procedure, and may only be done during town turns. Any number of foci may be modified (within reason), however, and this does not consume an entire town turn. Mages often need to draw on their own personal mana to cast spells, such as when using a focus. A character’s mana is replenished following a night of restful sleep. Certain items (such as mana potions) or spells (such as the black magic spell leech) may allow limited mana recovery between rests. Some items or effects may provide temporary mana. This mana functions like normal mana, but should be tracked separately, and evaporates after combat or one exploration turn. To cast a spell, a character must have the ability to use the type of magic in question (black or white) and either consume a spell crystal or spend mana to cast a spell through a focus. No magic is possible without spell crystals. PCs use wisdom saving throws to determine their magic defense, but most NPCs have a static magic defense (10 by default). Offensive spells require a spell check to determine their effectiveness. Mechanically, this is an intelligence check opposed against the magic defense of any targets. This functions sort of like an attack roll, but for mages, though there are a few important differences, the biggest being that spells that “miss” can sometimes still affect the target, though in a lesser manner. For example, spells with the save-half property still inflict half damage on a miss. For spells with multiple targets (such as area effect spells that affect an entire melee), roll once and compare that roll to each target’s magic defense score to determine the outcome. Add INT to damage done by spells (to the whole damage, not to each die). For example, a black magician with INT +2 does 2d6+2 damage with a blaze spell. Some spells have effects that persist. Only one persistent effect may be maintained by a mage at any given time; sustaining a spell does not consume any additional mana beyond the initial cost. If another spell with the sustain property is cast, the previous sustained effect ends. Instantaneous spells (that is, any spell that does not have the sustain property) may be cast while sustaining a spell. For example, a black mage that is sustaining the fly spell may cast a shock spell from the air, but if they cast a darkness or invisibility spell (both of which also require sustaining), then the fly spell will end. Sustained spells also end if the caster becomes unconscious. This entry was posted in Rules and tagged JRPG Basic, magic-user on June 29, 2013 by Necropraxis. You said that a large number of foci can be managed. Are you planning on having extremely constricting encumbrance system or will any more experienced mages be carrying a vast selection of spells already in foci at all times? How do you feel this affects the strategic aspect of having to choose which spells to prepare ahead of time? Of course you are restricting the preparing part to towns so it makes things a bit different but still is that something you are foregoing or just have other mechanics for? The quick version: a list-based system that applies an encumbrance penalty to all physical actions if you are carrying more than a strength-derived limit of significant items. 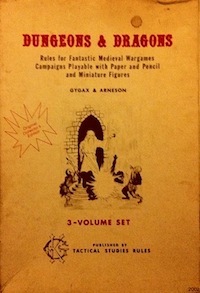 I’ve been using this system for a while in my OD&D game, and have been quite pleased with it. Since there are only ability mods in this JRPG Basic game though, the limit is 10 +STR significant items. Foci are significant for purposes of encumbrance, but spell crystals are not. Crystals and foci will be further limited by availability, either as treasure, or by cost (when they can be found to be purchased). Basically, the same thing that keeps a magic-user in trad D&D from carrying an unlimited number of fireball wands or lightning bolt scrolls. I feel like there are two basic levels of resource management in this proposed spell crystal system. Level one is which spell crystals you decide to put into a focus (and thus make reusable). Level two is which spells you spend mana on. Because of the game world logic of the system (crystals, foci, and mana), I hope that these choices will seem clear to players without needing to engage in a lot of jargon or other game systems. It makes a lot of sense. Actually I use a very similar encumbrance system to what you linked, with the only difference being that most heavy items (armor etc) cost many points. The comparison of foci to D&D wands or scrolls is not one I would make however since one is limited use. However if their availability is so scarce that it just isn’t feasible to a) buy, b) carry or c) store all crystals in foci you have, then there remains meaningful choice at “level one” as you referred. Of course it’s much more relaxed than many other games since there is the added restriction of mana. Yeah the assumption is that foci will probably not be available in the quantity required to seat all crystals. Also, there is some tactical tension between an unseated crystal (which can be used without paying mana, like a scroll, if you don’t mind using it up) and a focused crystal (which costs mana to use). Cool stuff, I look forward to reading more. One question I had though, is how much mana do spells take to cast? Most spells cost from 1 to 3 mana and are approximately equivalent in power to traditional spells of level 1 through 3, respectively. One basic guideline I’ve been using (for the attack spells, at least) is that 1 mana spells have a single target, 2 mana spells affect a row, and 3 mana spells are an area effect (what I am calling a “full melee” target). I think there will also be spells that require 4 mana to cast, but they will probably have extra rules, as I see them as sort of “super spells,” that are not to be cast quite as freely.